If you're like most parents I know, your children's planned summer activities are coming to an end. Almost every parent I've talked to the past few summers have their children participate in organized camps and classes at some point in June and July, but leave the month of August open for spontaneous fun and family time (my family included). 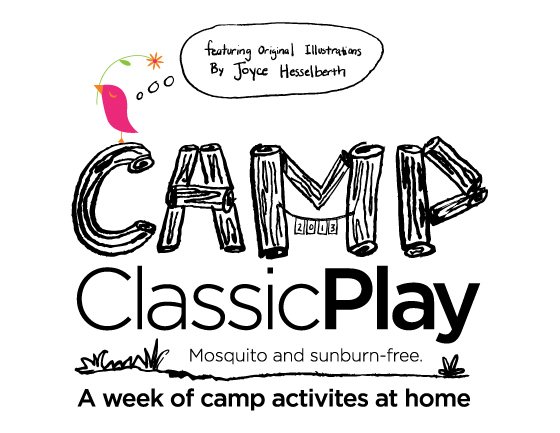 Camp Classic Play is a week-long list of classic activities put together by some of my favorite fellow bloggers. If your family completes the activities, there are badges and a downloadable certificate to print out in the areas of Science + Nature, Athletics + Games, Gardening, Arts + Crafts, and Cooking. To get your family started on this classic play adventure, visit classic-play.com. Now go and make some summer memories!